Mike Cloud insists on the content of form and the figures of abstraction. A primary strategy in this aim is literalism. Blood Diamond, Cloud’s painting on the second floor of Surviving Sandy, is about diamonds and looks like one. Much of the paint depicts what look like building blocks, a reference to geometric abstraction as well as the organic crystalline structure of diamonds. In the middle of the painting there is a passage that could be a maze, and might even suggest the figure of a miner bent over the crystals. 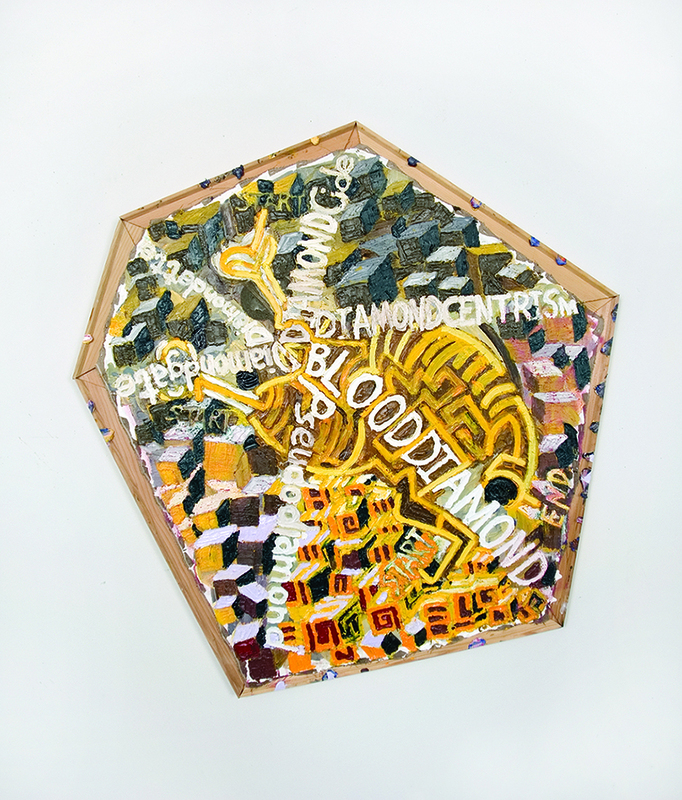 Mike Cloud, “Blood Diamond,” 2013. Oil on canvas, 37 x 41 1/2″. Courtesy of the artist. Cloud’s incessant repetition calls forth the worldly implications of his chosen form. What at first looks like a relatively benign, pleasantly colorful, shaped abstract painting is revealed with each diamond-iteration to be a form loaded with social commentary. Extending out from the center and toward each obtuse-angled corner is a phrase—“BLOODDIAMOND,” “Pseudodiamond,” “Diamondgate,” “Diamondette,” “DIAMONDCide,” and “DIAMONDCENTRISM”—which seems to depict the receding edge of a cut gemstone as seen through its shiny, flat surface. The reiteration of the word keeps diamonds on the mind, almost as a dematerialized image. The phrases themselves describe the political and social consequences, past and present, of our aestheticized cultural demand for the rock: what the demand makes of us (diamondettes) and what we will commit for them (diamondcide). Cloud’s other work, in the Beauty of Friends Coming Together component of Surviving Sandy is Travelling Barricade, a wooden tent-like structure with two triangular paintings and a jutting white-painted canvas “flag.” The piece uses formal strategies to play with the meaning of the white flag—as surrender, an invitation to negotiate, and even its use as the French pro-monarchist symbol to invoke French revolutionary cycles. In this way it comments on the complicated relationship between a political context and the art it produces; the maze-like transitions between social idealism and disillusionment. Again, Cloud’s assertion that a shape is also a cultural icon that has particular baggage allows for the painting to become an index of that baggage. The implication of this kind of consideration is to negate formal neutrality in art. If art has a separation from the world, it is not the separation of ideal forms and the ascension to truth via purity and painterliness. Art’s separation ought to be that of commentary, i.e., form as a forum for lateral comparisons with life. The transformation that occurs in Blood Diamond is most palpably a shift in thought, effected by a formal and material prompt. In it, Cloud argues for an attitude toward form that is aware of its repercussions and varied meanings, and thus alive in the world.